Oh man, I was making egg bites to beat the band all break, and I have to say, you ladies with your perfectly crusty egg bites, I salute you. I have no idea how you get your egg bites so perfectly out of your muffin tin, I tried oiling the cups, lining them with paper liners, lining them with foil liners, lining them with foil liners and oiling the liners, and everything stuck and I LOST LITTLE BITS OF EGG, THOSE ADD UP YOU KNOW, and I added eight minutes to my RealAge scrubbing out my muffin tin, and finally I hung up the muffin tin and took down my trusty old baking pan. And a roll of parchment paper. And the olive oil. I'm not actually sure that the parchment paper wouldn't do fine on its own, but I'm too scarred to find out. Oh and, heat the oven to 400 degrees. Okay now, put the two pounds of frozen broccoli in a microwave-safe mixing bowl and cook according to package directions—e.g., cover the bowl with saran wrap, microwave it for four minutes, stir it up, and microwave it for another four minutes, and that should do it if you have a normal-powered microwave. Which I do not, I have a half-pint microwave that takes at least a third and sometimes a fourth four minute cycle, and the reason I go to all this bother is so my broccoli is right in the bowl that I'm going to mix it in. There used to be an intermediate step here where I turned the broccoli out on my cutting board and gave it a rough chop, which removes a bit of moisture and yields a kind of chewier egg bite, sometimes I do that, sometimes I'm too lazy to do that. Add the bread crumbs, cheddar, and green onions to the broccoli and mix thoroughly, by which I mean, with your hands. I found that the very best thing to beat eggs with is my rocket blender, though it only holds six eggs at a time. So I crack six eggs into the blender cup, blend it for twenty seconds, pour it in the mixing bowl, crack the other six eggs into the blender cup, blend it for twenty seconds, and pour it in the mixing bowl. Then I mix it thoroughly again with my hands. 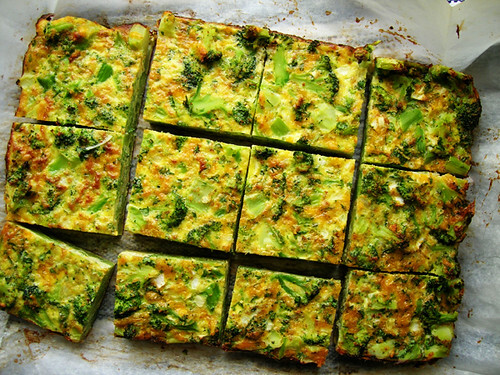 Pour the broccoli-egg mixture into the parchment-lined pan. Put the pan in the oven and bake for 20 minutes, turn the pan around, and bake for another 20 minutes. The eggs should be pretty well set when they come out of the oven. Here's the best part: you grab the edges of the parchment and lift that baby right out of the pan. And you hang your pan right back up. And the parchment peels perfectly away from the precious egg bake. Let the egg bake cool for a bit, then slice it into twelve pieces with a serrated knife, then slice each piece into nine bites. I always eat two eggs, except when I eat three, so two pieces or eighteen bites is a serving for me. They go into a quart-size mason jar, I let them cool completely before putting on the lids and putting them in the fridge, so condensation doesn't make them soggy. To serve, reheat in the microwave for two minutes.